If this report appears a little late, then you'll forgive me, this particular EFW outing took place on my stag-do, and believe me, I needed a rest afterwards. The entire stag-do would be a tale of boats, bratwurst and erm, beer, but I'll stick to the football. The initial idea was to catch St. Pauli's last game of the season, but we were informed that any attempt to secure 30 tickets for a game against Bayern München would be pure folly. (As it was, around five of us managed to get in for the 8-1 drubbing that FC hollywood handed out, but that's another story). The Stadion Hoheluft translates as the high-air stadium, and as the ground wasn't at altitude and in a very urban setting, I'm guessing something was lost in translation. 6 euros got you in, which included a programme and a fanzine. 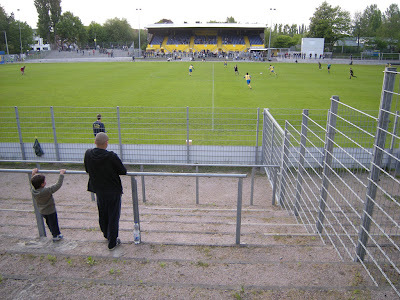 The ground was 3 sided, one with a seated stand, two others of terracing, leaving one end simply a picturesque row of trees. I'd equate it to a decent League Two ground in England. €6 for a match ticket, programme and fanzine. Oh Germany, you've done it again you tinkers. The electronic scoreboard at the clock end. 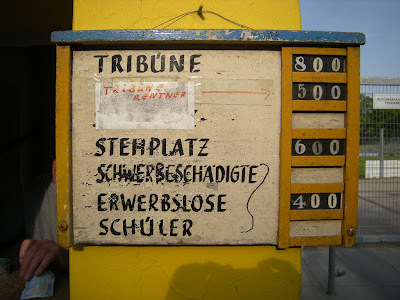 We were led to believe that kick-off was 6pm, but it appears we were an hour early, so we made our way to the bar, which specialised in cheap ale, currywurst, and a pair of good-looking German twins who became firm favourites of the visiting Mancunians. 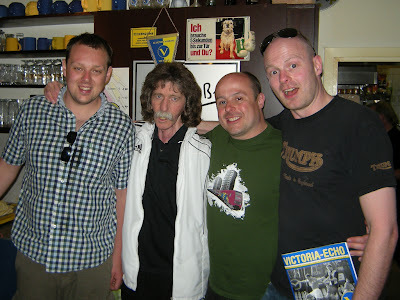 Sat at the bar was Hamburg footballing legend Walter Frosch, (translation: Walter Frog!) who's picture was all over the bar covering an illustrious career that seen him play at the likes of Kaiserslauten and in particular with St. Pauli where he has attained legendary status, due to his liking of drinking, smoking and the charms of the Reeperbahn. He was happy to have a few snaps with us, the lads taking particular delight in his incredible moustache and mullet combo. His rather odd reaction was to try and grab one of our lot by the family allowance. 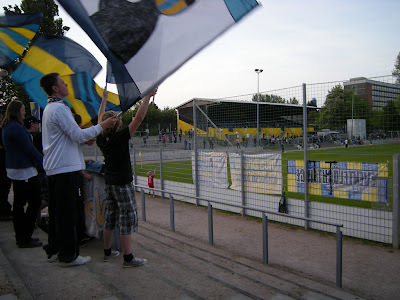 It seemed a shame to leave the clubhouse, but we were here for the football, so made our way on to the terracing behind the right hand goal, with a small band of ultras, who tried their hardest to create some sort of atmosphere. However, the game had the distinct feel of an end of season dead rubber, the beer was going down well, and the glorious weather made the game less of a spectacle, coupled with the game being of particular poor quality. 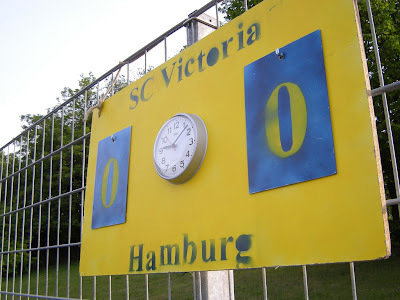 Meiendorfer deservedly took the lead just before half time and it was straight back to the clubhouse, which after the quality of the football, was difficult to leave again, however, most of us made the effort. Some members of our party began to flake out after six hours of boozing at the Harbour festival earlier, and those still standing had a good chat with the Victoria fans who were pleased we'd chose their game in preference to the what they perceive as the tourist attraction that is FC St.Pauli. 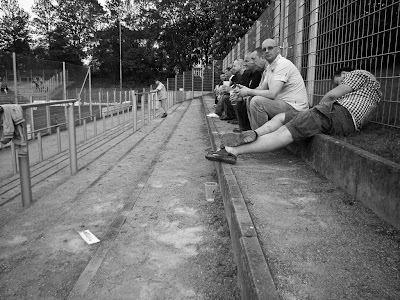 And with this lovely old skool terracing, I think we're done here. Ah, not so fast nicotine, we haven't had the 'table full of beers' shot. Here we go. And relax.